The First Letter of Peter opens with a blessing which is also a proclamation of what is addressed in the letter, namely God’s work. Peter is praising God and proclaiming God’s greatness. The prayer begins blessing God, describing a new birth to a living hope through resurrection that we all inherit, safe in faith leading to a final salvation revealed when Jesus returns. We rejoice in hope even though we may have to suffer, declaring our faith genuine and precious we praise, glory and honor Jesus. 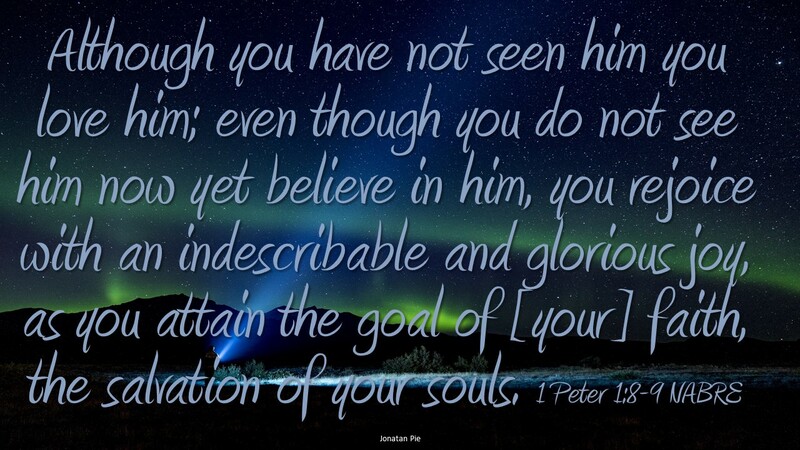 Peter declares faith, praise and revelation even though we have never seen Jesus yet we love Him, we believe in Him, and we rejoice “with an indescribably glorious joy” as we attain the goal of our faith; salvation. It is similar to Jesus’ declaration to Thomas when he appeared after the resurrection, “Blessed are those who have not seen and have believed.” (John 20:20) This blessing and this indescribable glorious joy describes each and every one of us believers today. We are included in the works of Jesus. He came and opened up salvation, the full inheritance of the Kingdom of God eternally, to all people, any who want it. How do we receive this inheritance; faith, loving Him, believing in Him, despite not seeing Him. Our faith is revealed in our action. The action faith requires; feeding the hungry, giving drink to the thirsty, offering home to the homeless, clothing the stranger, caring for the sick and visiting the prisoner. Any act of love is faith in action. Do you truly believe? Do you act in faith? Do you live in glorious joy?